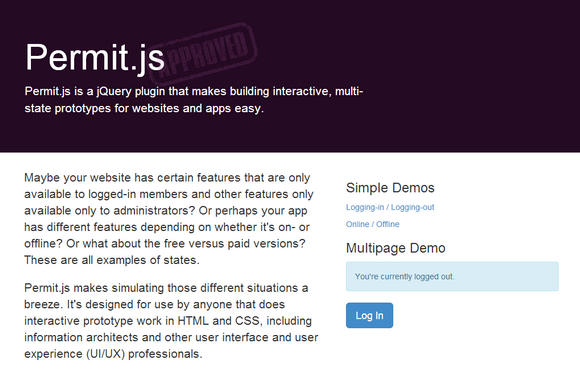 Permit.js is a jQuery plugin that makes building interactive, multi-state prototypes for websites and apps easy. Maybe your website has certain features that are only available to logged-in members and other features only available only to administrators? Or perhaps your app has different features depending on whether it’s on- or offline? Or what about the free versus paid versions? These are all examples of states. Permit.js makes simulating those different situations a breeze. It’s designed for use by anyone that does interactive prototype work in HTML and CSS, including information architects and other user interface and user experience (UI/UX) professionals.